John Aaron Rawlins was born in East Galena, Illinois on February 13, 1831 to Scotch-Irish parents, James D. Rawlins, and his mother, Louisa Collier Rawlins. He was the second of ten children. In the early years, his father, a veteran of the Black Hawk War, became a prospector in gold and was absent from his family for long periods. Young John became the family patriarch while his father was away. Both parents, despite the long absences of his father, shaped his personality and character. From his father he gained his steadfastness, courage, and determination. From his mother, he gained a deep sense of morality and unbridled ambition. His education was mostly self-studied. John enjoyed the subjects of poetry, biography, and history. These studies generated a further interest in the law where from 1852 to 1853 he attended the Rock River Seminary at Mount Morris, studied law under Isaac P. Stevens, and was admitted to the Illinois Bar in October of 1854. A law partnership with David Sheean was undertaken. John was elected City Attorney in Galena, Illinois and served in that position from 1857 to 1858. After his term as City Attorney was over, John and his partner continued with the law practice until August of 1861 when he was preparing to join the army. On April 15, 1861, John Rawlins met Captain Ulysses S. Grant, the only soldier the town’s people of Galena knew. This meeting took place shortly after the bombardment of Fort Sumter, South Carolina. Rawlins was asked to attend and speak at the patriotic meeting, and he called upon the men to stand with the Stars and Stripes and the Union. Rawlins’ speech that night quietly impressed Captain Grant. The orator of Galena asked Captain Grant for his opinion and, Grant sitting by the fire, simply told him: “It reminded him a lot like hell. The lawyers are always closest to the fire!” This evening was the beginning a lifetime bond of friendship between the two just as the nation was being pulled apart. In the summer of that year, John spent his time in Goshen, New York attending to family matters as his wife, Emily Smith lay dying of consumption. While here, Rawlins received a letter from, now, Brigadier General Grant asking him to come back to Cairo, Illinois. Grant proposed a staff position for him to fill with the rank of Captain to go with it. When Emily passed away on August 30,1861, Rawlins arranged for the care of his children, returned to Illinois, and joined Grant at Cairo for what would become the birthplace of the Union Army of the Tennessee. With this army now organized and commanded by General Grant, Captain John Aaron Rawlins moved south along with it. His first sight of the elephant was on the western bank of the Mississippi River at a place called Belmont; and from there he would travel the river systems of Tennessee participating in the engagements of Fort Henry and Fort Donelson, as well as the bloody Battle of Shiloh. Promoted Major in May of 1862, he crawled along into Corinth, Mississippi after a brief change of command under Major General Henry. This occurred under the nation’s impression that Shiloh was a terrible disaster and that the enemy surprised Grant. Insisting Grant remain with the army, Halleck was later called back to the War Department in Washington, and Grant was reappointed commander of the Army of the Tennessee. John Rawlins, having been promised by the commanding general, that as he moved up in rank, so shall he; with the friendly help of Congressman Elihu Washburn of Illinois, he had done just that. In November of 1862, Rawlins was promoted to Lieutenant Colonel. With his loyalty and incredible administrative abilities to juggle the daily business of an Army, he would be promoted to the rank of Brigadier General six weeks after the capture of Vicksburg in the summer of 1863. It was in Vicksburg, Mississippi where John Rawlins met Miss Mary Emmaline Hurlbut; a governess employed within the city, yet a native of Danbury, Connecticut. The couple would be married in Danbury on December 23, 1863. John Rawlins continued at General Grant’s side throughout the campaigns in Mississippi and in the fall of 1863, Rawlins was appointed to the position of Chief of Staff for General Grant. The army was now moving to the rescue of Major General William S. Rosecrans’ Army of the Cumberland, which was starving inside Chattanooga. 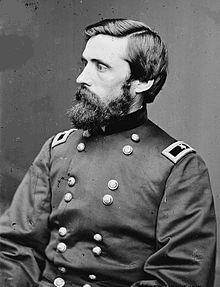 General Grant replaced General Rosecrans with Major General George H. Thomas and a very successful break-out occurred in mid-November. While at Chattanooga John began developing symptoms of the disease that took his first wife’s life. Although he attempted to convince his beloved, Emma, it was but a bad cold; in the back of his mind was the sad realization of the true nature of his health. These symptoms continued throughout the rest of the war. At times, he had a sense of recovery only to have the symptoms return with a vengeance. In March of 1864, Major General Grant became the first person in the United States Army since George Washington to be promoted to the rank of Lieutenant General. John accompanied him to Washington and the White House to receive his third star. He would be at Grant’s side throughout the Wilderness, Spotsylvania, North Anna River, Cold Harbor, and the Petersburg battles, only leaving Grant’s side once for health purposes between July and October of 1864. Upon Rawlins’ return he saw the end of the Petersburg Campaign in March 1865, and accompanied Grant on the foot race with Confederate General Lee along the banks of the Appomattox River; a chase that would eventually end on Sunday April 9, 1865 at the Wilmer McLean House at Appomattox Court-House. Upon his return to Washington in the spring of 1865, John would put on the second star of a Major General, and four years later continue his service to General Grant and his country when the General was elected President of the United States in 1868. He would become the nation’s 19th Secretary of War, but would not live six months into Grant’s first term. He died on September 6, 1869 and is buried in Arlington National. His beloved Emma, would contract the consumption as well and pass on November 6, 1874 at the early age of thirty four and is buried in the Hurlbut family plot in Wooster Cemetery, Danbury, Connecticut.